Well, one might tend to think that the Volkswagen Group’s luxury SUV onslaught would stop at the Audi Q7, the Porsche Cayenne and the Bentley Bentayga SUV. 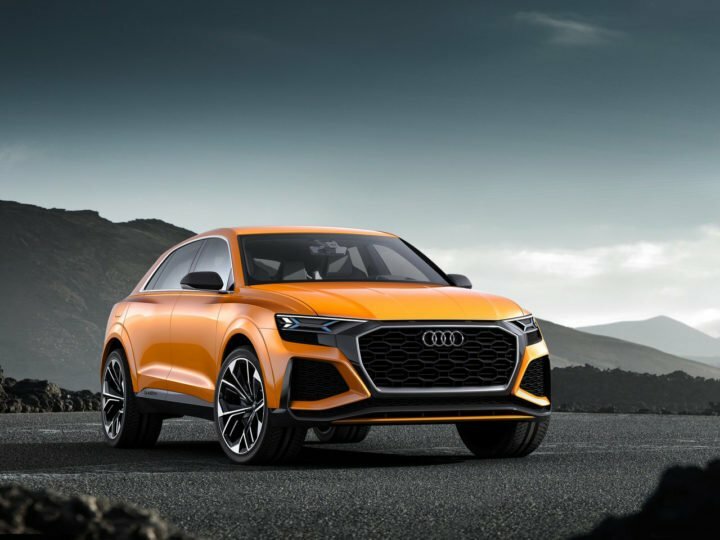 However, the German auto giant came up with the Q8 concept in January this year and the Ingolstadt-based carmaker has finally commenced road testing on the production-spec model. In a recent development, test mules of the upcoming luxury SUV have even been spotted undergoing trials on Indian public roads. 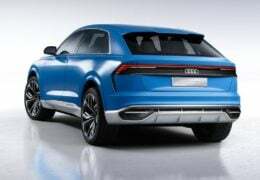 While we are still around a year away from the Audi Q8 India launch, there are good chances that Audi India would put on display the concept version of its upcoming flagship SUV at the Auto Expo 2018. The production-spec Audi Q8 will gon to rival the BMW X6 and the Mercedes GLE Coupe. The upcoming flagship SUV’s concept version has a length of 5.02 metres, a width of 2.04 metres and a height of 1.70 metres. The wheelbase stands at 3.0 metres. The production-spec model shouldn’t be too different in dimensions. In comparison with the Q7, the Q8 won’t be much longer or wider. However, it is expected to be around 50 mm shorter. 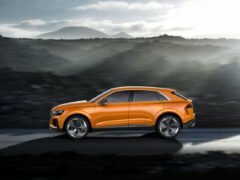 You can read on for all the available details on the Audi Q8 India launch. 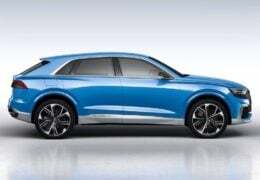 The Audi Q8 is likely to become the company’s first new launch for next year. It’s pretty much for sure that the new luxury SUV is India-bound. However, at this moment, it will be tough to put a finger on the exact launch date. That said, we are pretty sure that the new Audi Q8 India launch will take place by the end of 2018. A late-2018 launch date can’t really be ruled out. We will update you with more concrete details as soon as we can get an official word from the company. The car that has been seen in the spy images doing rounds of the inter-web is of a test mule that is a part of the company’s global testing program. 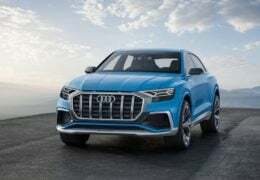 While official prices will be revealed only at the time of the launch, it is very likely that the upcoming Audi Q8 SUV will launch in India at an ex-showroom price of around Rs 1 crore. With this, the Q8 will become the costliest Audi car in the country. Audi might even decide to launch the sportier SQ8 variant here, which will cost even more. The specifications in the table above are of the SQ8 performance version. The most powerful version of the company’s upcoming SUV will get its juice from a 3.0-litre, TFSI, V6 Petrol engine that produces a maximum power of 476 BHP along with a peak torque of 700 Nm. Also, there is a 20kW electric motor. The gasoline engine also gets an electronic compressor to keep turbo lag under check. 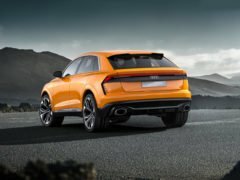 Audi claims that the new SQ8 can sprint from 0 to 100 kmph in just 4.7 seconds and go on to hit a top speed of 275 kmph. 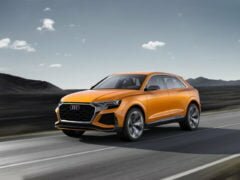 The regular Audi Q8 SUV will come with V6 and V8 petrol and Diesel engines that will offer a respectable power output and low emissions. Internationally, the Q8 might even get a couple of plug-in hybrid variants. Going by the company’s latest nomenclature system, the odd-numbered SUVS (Q3, Q5, Q7) are regular models with even-numbered SUVs being their sportier siblings. By this measure, the Q8 will offer a more involving drive than the Q7. Speculations are rife that the new Q8 SUV will be up to 300 KGs lighter than the latest-generation Q7. The Q8 has a slightly coupe-ish roofline and doesn’t have the boxy appearance of a typical SUV. The upcoming model is bigger and should look classier than the Q7, the Mercedes GLE and the BMW X6.The Q8 will become the first of the handful of upcoming stylish crossovers from the Ingolstadt-based company. While it won’t look too much like the current models in the Q-range, the car will be nstantly recognisable as an Audi with its gaping hexagonal grille and sleek LED headlamps. We are pretty sure that the upcoming SUV will look a lot more upmarket than the Q7, which is saying a lot as the latter is a pretty handsome car. Various spy images of the Q8 have show that the production model stays true to its concept version. The front-end of the car is characterized by an octagonal single piece grille that is flanked by a pair of sleek matrix LED headlamps. In its side profile, the concept version was seen sporting a two-tone paint job. However, the production model will likely give this styling detail a miss. The rear-end comes with a huge spoiler and taillamps running across the width of the fifth door. Akin to the exterior, the interior of the new Audi Q8 SUV will have an upmarket interior that will have a hint of sportiness. Safely expect the interior of the production-spec Q8 SUV to reek of high-quality materials and large touchscreen interfaces. Glossy black surfaces dominate the dashboard of the concept. There are barely any physical buttons in the cabin of the concept SUV. However, the same might not hold true for the production version. From the looks of it, the Q8 will be a strict 4 or 5 seater. Stay tuned for latest news updates on Audi Q8 India Launch Date, Price, Specifications.